Nova Scotia's largest health authority recently disclosed two serious medical mistakes. In one case, a woman had a mastectomy she didn't need, after an incorrect cancer diagnosis. CBC News wanted to know how many of these errors -- termed adverse events -- happen in the province. We contacted each health authority and asked for the information on the number of "events" in their region. There is no consistent method of collecting or reporting from one health authority to another. Click on your region below to find out what we learned. 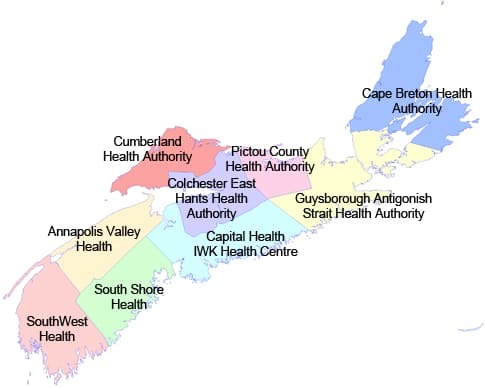 The Pictou County Health Authority encourages reporting of incidents as a way to improve patient care. A reportable occurrence is defined as an event that is inconsistent with routine client or patient care. It may also include any accidental injury or any unusual event involving visitors, clients, staff and/or volunteers. Examples of such occurrences are missed service appointments, availability of correct equipment for procedure, and food issues. The CHA has two categories of incidents with five reporting levels in each category with the highest being an incident that results in death. The vast majority of incidents fall into the lower levels. In 2011, no incidents were categorized into the two highest levels (severe or death) and in 2012, only one incident was categorized as severe (it was a fall with a fracture). There were no incidents that resulted in death. South West Health does have a policy for tracking and reporting of "incidents". We also have a separate policy regarding the Disclosure of Adverse Events to patients, families, etc. Our system for tracking adverse events also includes near misses as well as incidents resulting in no harm – so the numbers above reflect incidents that caused no harm (for example, a medication that may have been given at the wrong time, or a patient fall that did not cause injury). Medication incidents and falls are our two most commonly reported patient related incidents. None Apparent: No injury sustained as a result of the incident. Slight/Minor Treatment: The incident resulted in abrasion, reddening of the skin, a bump, a bruise or other apparently minor damage to tissue. The treatment required was non-invasive, e.g. topical ointment, dressing or ice pack. Medication variances which may require monitoring, such as increases in vital signs or lab tests. Moderate: The incident resulted in temporary impairment and clinical intervention, e.g. sutures, first and second degree burns. Incidents, which have the potential for serious outcomes that, require monitoring/intervention. Serious: The incident resulted in a fracture, hemorrhage, aspiration, serious drug variance/reaction or death. The incident resulted in admission to hospital (outpatient or visitor), transfer to critical care areas, or increased length of stay (inpatient). An incident considered “Serious” would also be called a Sentinel Event – that is an unexpected incident which leads to death or major injury to a patient. We also track Near Misses – a Near Miss is an event which has not caused harm to the patient, but the potential for harm exists. South Shore Health encourages reporting of incidents as a way to improve patient care. An Incident is defined as any event that is inconsistent with routine client, patient or resident care. It includes any accidental injury or unusual event involving clients, staff or visitors and/or damage to District property. The incident/occurrence has or could potentially result in injury or loss to the patient. Examples of include: Falls, Burns Medication errors, Devise failure/damage resulting in injury. Patient injury secondary to treatment or procedure, patient leaving the hospital against medical advice, damage to property (broken windows/damaged walls/sewage leaks) verbal threats or physical assaults from clients under care in the hospital and community, anaphylactic reaction following immunization or an unexpected death. Serious incidents are defined as those that result in harmful effects that require immediate interventions to resolve or prevent further deterioration of the patient condition, or results in death. This would include any event which prolongs the length of stay such as a fracture resulting from a fall or an unplanned surgery. In medication events this would include anaphylactic shock or sudden decrease in pulse blood pressure or respiration. Other examples include patient suicide, surgery on the wrong person or body part or a missing patient. The overwhelming majority of incidents are categorized as Near Misses or No Harm. However it is important to report and monitor these near misses as it gives us an opportunity to prevent or reduce the risk of future harm. CEHHA recognizes the reportable occurrence process as a key method of improving the overall management of patient care. Reporting incidents is considered the foundation of CEHHA’s risk management program as it serves as an important communication and educational tool to highlight areas for quality improvement and risk reduction. The reportable occurrence process is targeted to benefit patients and their families, staff/physicians, volunteers, visitors, and the public. A reportable occurrence (also referred to as an incident) is an event or situation that is unexpected within the routine operations of the Health Authority or the routine care of the patient. This includes specific events and instances of potential liability. All staff/physicians are accountable for communicating reportable occurrences. Whoever discovers or witnesses the incident should make the report. Due to very low numbers in some categories, we do not release specific numbers to avoid the possibility of identifying a specific patient. These numbers are tracked/reviewed internally though our quality review process, including regular reporting to our Board Quality Management Steering Committee. We are looking at moving to an electronic system that would allow for real-time tracking and monitoring of reportable occurrences. All category 4&5 events are reported to the Department of Health and Wellness. All reportable occurrences that impact or could potentially have impacted a patient are disclosed to the patient/their family. Based on this definition, GASHA Incident Reporting System captures all incidents, not just those limited to patient involvement. Further, this system captures what are known as near misses, incidents which could have resulted in an unintended or unwanted outcome, but were avoided by chance, recognition and corrective action, or other mitigating factors. Incidents are categorized by type, degree of injury, and chance of re-occurrence; the vast majority of incidents are categorized as “Near Miss / No Harm” or “Minimal Harm”, however it is extremely important to capture these incidents as they provide excellent learning opportunities to increase safety and reduce the risk of future harm. GASHA’s objective related to the Incident Reporting System is to increase the overall reporting of incidents so that all incidents may be reviewed allowing for improvements to patient safety and quality and help to prevent future error. Within GASHA, incident reports may be submitted anonymously, this allows individuals to feel safe reporting without fear of reprisal. We cannot say how our numbers compare to others because there is such variation in how reporting is managed. At the IWK, patient safety is our number one priority. Staff reporting of all patient related events is strongly encouraged. The goal of an effective patient safety program is to ensure that all events are recognized, recorded and followed-up on. The vast majority of these reported events do not result in harm. We disclose all harm-related events to the patients/families affected. Events resulting in temporary harm include events that may have contributed to or resulted in a patient requiring an intervention or a hospital admission and/or longer stay. For example, an intervention such as a repeat blood sample, or hospitalization to monitor temperature and blood pressure. events that may have contributed to, or resulted in, permanent harm; required intervention necessary to sustain life; or contributed to, or resulted in, the death of a patient. We have recorded no events in the past two fiscal years in that last category. This info is reported on our website as part of our reporting on our progress on our 5 key directions, one of which is “Keeping Patients Safe”. Each quarterly report includes these numbers. The events can range from near miss, to no harm, minimal harm, to serious or permanent injury-harm. Our policy on disclosure is: there be disclosure to patients or the substitute decision maker (often next of kin). AVH uses an electronic Adverse Events Management System to track any adverse events that may occur in the district. AVH has a Serious Adverse Events Policy that directs how serious events are investigated and managed along with a disclosure policy that outlines how communications are completed to those impacted, patients/families, including DHW and public. There is a wide range of adverse events that are tracked. Those that cause no harm are often called near misses or good catches. All events are considered when planning for quality improvement in the health system. There is presently no standardized severity rating or categorization of patient safety events in the health system, which complicates the ability to aggregate or compare data beyond the local level. Most of the events reported (97 per cent) at Capital Health are in the categories of near miss/no harm or minimal harm categories. We require and receive reporting even on near misses - i.e., where an action could have resulted in harm for the patient but did not because some system or process intervened and prevented the error from reaching the patient. No harm also means the error has been caught before reaching the patient. An example of minimal harm would be that a blood sample came to the lab with not enough blood in the vial, so the sample has to be retaken. The minimal harm is that another blood sample has to be taken from the patient. Of note: the goal of a patient safety reporting system is to increase reporting so that all patient safety incidents are known and are reviewed so that we can improve patient safety and quality and help to prevent future error. We have intentionally made our reporting system anonymous so that we can increase reporting. Increased reporting is an indication of a positive patient safety culture.